When talk turns to politics in Alabama, it usually leads to the Governor’s race. In Alabama politics the Governor’s office is the Brass Ring. It is talked about more than anything else around coffee clubs and kitchen tables from Sand Mountain to the Wiregrass. It is comparable to college football being the king of all sports in Alabama. Kay Ivey enters the race as the favorite. She is the quasi incumbent having taken over the ship of state this time last year from beleaguered and tarnished Governor Dr. Robert Bentley. She probably would have gone to the house with her dog Bear with the plaudits of having served two terms as State Treasurer and two terms as Lt. Governor, which is not a bad legacy. However, now she can add Governor to her epitaph. Kay has been around Alabama politics for quite a while. She has been thought of as vibrant over the years. However, recently her demeanor and appearance belies the fact that she is only 73. This premature aging becomes apparent when she gets out campaigning and speaking. This elderly resonance and cognizance will not detract from her being elected to a full term. However, if I were running her campaign, I would limit her appearances. They should keep her in the Governor’s office and use photos from a few years back and take credit for the upturn in the economy. Her support is a mile wide and an inch deep. A slip and fall could derail her train. My first term in the Legislature was George Wallace’s last term as Governor and to say he was incoherent would be an understatement. He was on heavy doses of medication to alleviate the constant pain he had to endure from the bullet wounds from an assassination attempt while he was running for President in 1972. Therefore, Kay’s slowness does not deter her from being elected or from probably doing a better job than most governors we have had. My observation over the past 50-years is that we really do not have to have a fulltime governor of Alabama. Big Jim Folsom was drunk his entire second term, George Wallace was on pain pills his last term and did not know where he was, Fob James was totally disinterested in being governor his second term and went duck hunting the whole time. They put Don Siegelman and Guy Hunt in jail. Poor ole Bentley fell in love at 72 like a little school boy and walked around with a glazed look in his eyes and sheepish grin, and lost all sense with reality. They kicked the poor old fellow to the curb. Kay came on board and seems to have steadied the ship of state. Kay’s most daunting opponent is Huntsville mayor, Tommy Battle, who is actually responsible for the largest economic development announcement for the state in the past several years. The landing of the Toyota-Mazda plant in Huntsville several months ago was a real coup. Battle is 61 and has been Mayor of Huntsville for over 10 years. 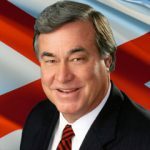 Some would argue that if he could do half of what he has done for Huntsville for the State of Alabama, he would be the best Governor Alabama has had in generations. Mayor Battle has raised a lot of money and will come out of the vote rich Tennessee Valley with a strong base of support. He may give Kay a run for her money. Birmingham Evangelist, Scott Dawson, is hoping to garner the evangelical vote. He is running a spirited campaign and could be a factor. State Senator Bill Hightower from Mobile is somewhat of an aloof fellow, who will probably not be a factor. Whoever wins the Republican nomination will be favored to win the race in November. The odds favor a Republican 57-to-43. However, you have two formidable thoroughbreds vying for the Democratic nomination. Former Chief Justice Sue Bell Cobb and Tuscaloosa Mayor Walt Maddox will fight it out for the nod in the June 5th Primary. There probably will not be a runoff. Either Cobb or Maddox will win outright depending on which way Alabama’s African American voters land. Most observers predict that Walt Maddox will prevail. He is 45 and has been Mayor of Tuscaloosa for 10 years. Being mayor of a major city is probably the best training ground for governor.